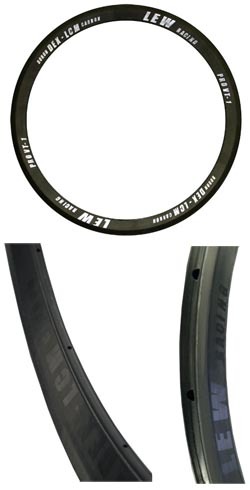 Lew Racing has increased the strength and stiffness of its PRO VT-1 rims by 85% for its 2008 product launch, which was released at Interbike 2007. With its new laminate design the company is able to achieve up to 65 pounds of dynamic laterial deflection (without the benefit of spokes) before failure, compared to only 30 pounds for previous rims. Plus, the enhancements come at no increase in the overall weight of the wheels. The Lew PRO VT-1 rims are now available in 16, 20, 24, 28 and 32 spoke hole drillings and now have an unprecedented 2 year manufacturer's warranty. The spec weight has also dropped from 290 grams to 280 grams. Says Paul Lew, founder and CTO of Lew Racing, "By using advancements of our DEX-LCM technology we ere able to achieve applied material properties that exceed typical laminate performance." Lew Racing is also pleased to announce a drop in MSRP for our custom rim buildup program. Base price for custom sub 900 gram wheelsets start at $2,495 USD. Check out the custom rim program here.